Manitoba is one of Canada’s prairie provinces, but to assume this region — roughly the size of Texas — is endless grassland would be a terrible injustice. It’d also be downright incorrect — lush boreal forests, hidden waterfalls, white sand beaches, rushing whitewater, polar-bear-packed tundra, and desert-like dunes are hiding in plain sight here, too. So get yourself to Winnipeg, the provincial capital, and then get outside — and stay outside. Here are 11 outdoor adventures worth planning a trip around. 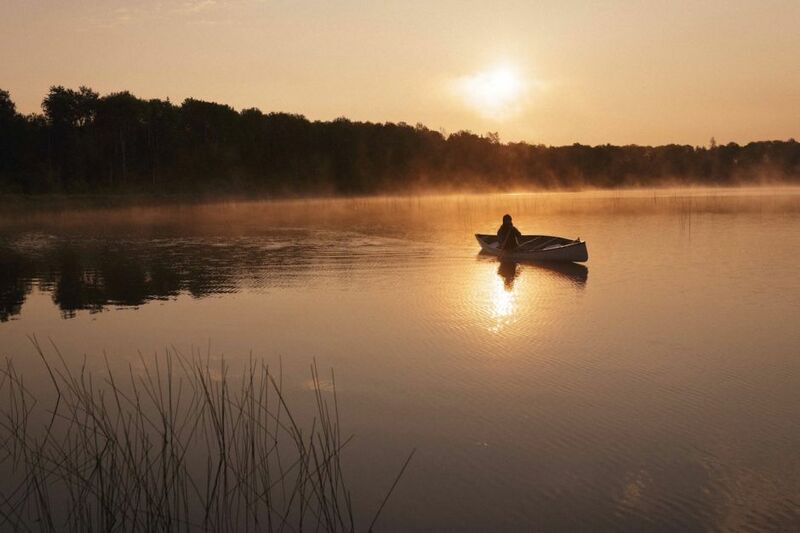 With dense forest that rises out of the prairie, postcard wildlife (moose, elk, black bears, bison), and the amiable resort town of Wasagaming, Riding Mountain National Park provides a solid introduction to Manitoba’s natural beauty. It’s located a little over three hours west of Winnipeg and is easily accessible by car or bus. Once you’re in, there are 250 miles of trails to choose from, so let’s narrow it down: Hikers tend to gravitate toward Gorge Creek Trail and its forests and wildflowers, or the treetop panoramas of Bald Hill Trail. Mountain bikers hit the dirt on Clear Lake Trail and Reeves Ravine. For great views, look for the eight sets of red chairs placed in photogenic spots within the park. “You’re bound to find them at a place that compels you to stop and take in your surroundings,” says writer and photographer Jenn Smith Nelson. If the landscape somehow doesn’t give it away, the red chairs will. Tip: For somewhere more unique to stay than your own tent, try glamping in an oTENTik (a combination tent/cabin) or a MicrOcube with a panoramic window, both among the unique lodging options offered by Parks Canada in Riding Mountain National Park. Wasagaming, sometimes referred to as a “mini Banff,” is also a good bet for accommodations; it’s one of the only towns set within a Canadian national park. Around 90 minutes east of Winnipeg, Whiteshell Provincial Park lays claim to 200 lakes and all the hiking and mountain biking trails you’d expect in a place this scenic. “It’s really Winnipeg’s playground, because it’s such a quick day trip from the city,” explains Jillian Recksiedler, senior content specialist for Travel Manitoba. Hike to the park’s highest elevation via Top of the World Trail, unwind with a beach day at West Hawk Lake, or visit the ancient stone formations at Bannock Point, an active indigenous ceremonial site. Lodging includes 10 different park campgrounds, log cabins at Falcon Beach Ranch, and chic eco-cabins at Falcon Trails Resort. You can get seriously off-grid with just a few hours’ drive from Winnipeg — Twin Rivers Travel shuttles paddlers into the Precambrian Canadian Shield’s pristine boreal forest for intimate, all-inclusive canoeing and camping trips that also feature hiking, fishing, swimming, and foraging for wild blueberries, mint, and Labrador tea. “We like the southeastern part of the province because it’s completely wild,” says co-owner Sam Anthony. “On many of our excursions, we literally won’t see anybody else.” On these trips, you can paddle the crystal-clear lakes of Nopiming Provincial Park or opt for a whitewater adventure on the Manigotagan River. “All of the rapids are Class III or under, so you don’t need any whitewater experience,” explains Anthony. Note: For those picturing some sort of Hunger Games-style force field, the Canadian Shield actually refers to a zone with some of Earth’s oldest rock, the core of the North American continent. Finding some of Manitoba’s best fishing spots requires a skilled guide…and a floatplane. Upscale accommodations, guide services, and dining — from hot coffee in the morning to savoring the day’s catch that evening — are part of the fly-in fishing lodge experience. Gangler’s North Seal River Lodge and Kississing Lake Lodge cover remote watersheds in the province’s north and west. Aikens Lake Wilderness Lodge in Atikaki Provincial Wilderness Park promises to get travelers of any skill level on the water the day they arrive. “People are out just as much for the experience as for the fishing,” says co-owner Pit Turenne. More than a thousand miles of coastline, powdery white sand that would make the Caribbean jealous, and a plethora of uncrowded beaches make Lake Winnipeg a favorite local getaway — and it’s just an hour’s drive from the capital. On the eastern shore, Grand Beach earns its name with white sand, a busy boardwalk, grassy dunes, and popular hiking trails. 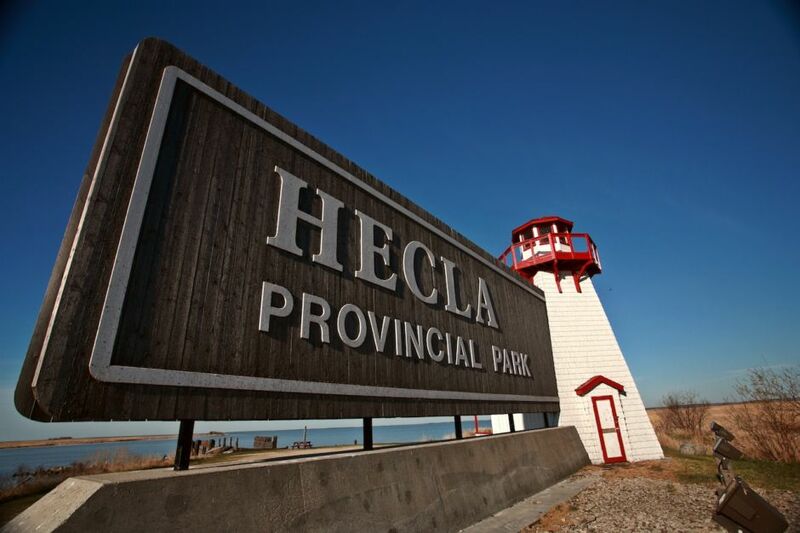 To the west, Manitoba writer Shel Zolkewich recommends the Matlock Beach swimming pier in the village of Dunnottar. “For early risers, it’s the best place to watch the sunrise,” she explains. 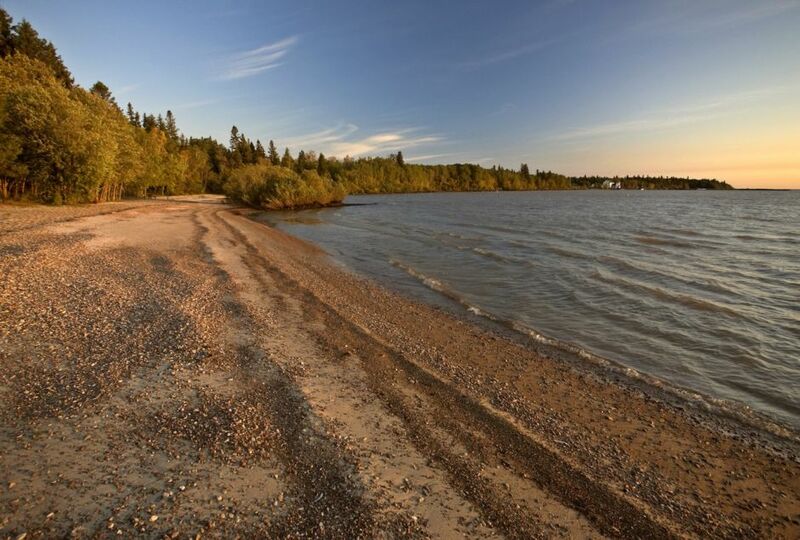 Located well off the tourist trail near the town of The Pas in northern Manitoba, Clearwater Lake Provincial Park is a secluded enclave of tropical-esque blue waters, craggy dolomite rock formations, and some of the province’s best scenery. Here, you have two jobs: to book a yurt, and to soak up the restful solitude of lake life. The large lake is as clear as its name suggests, and there’s excellent swimming and paddling. Throw a line in the water to snag a trophy lake trout, whitefish, or northern pike, or hike through the mossy, cave-like rock formations along the shore. 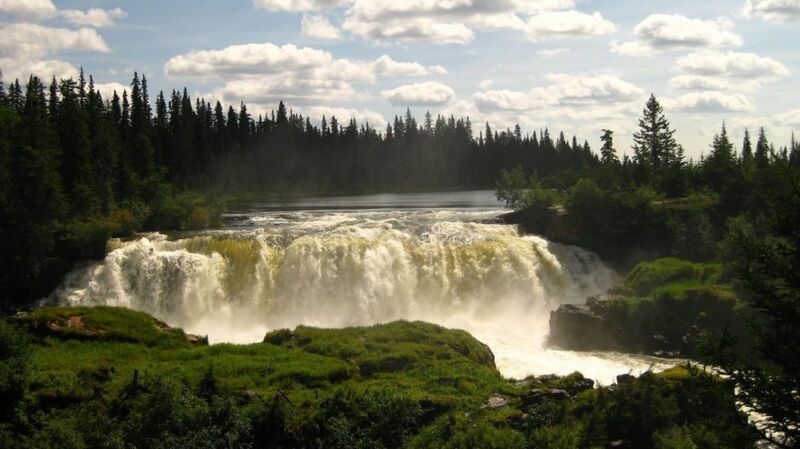 Some of Manitoba’s most dramatic natural attractions are located in the small but mighty Pisew Falls Provincial Park, a short drive south of the city of Thompson. Here, the cascading waters of Pisew Falls are visible from easily accessible observation platforms — no strenuous hiking required. The water crashes to the rocks 40 feet below, creating its own misty microclimate. Experienced hikers can also reach Kwasitchewan Falls (the tallest in Manitoba) from this point. The 14-mile round-trip trek is challenging; if you needed, you can take advantage of the backcountry campground and make this a two-day adventure. Drive two hours west of Winnipeg for one of Manitoba’s most surreal landscapes — the desert-like dunes of Spirit Sands contrast sharply with the surrounding plains (fun fact: they’re also home to Manitoba’s only lizard, the northern prairie skink!). Hike farther into the provincial park to gaze into the eerie, green-blue waters of the Devil’s Punchbowl, a pond fed by an underground stream. 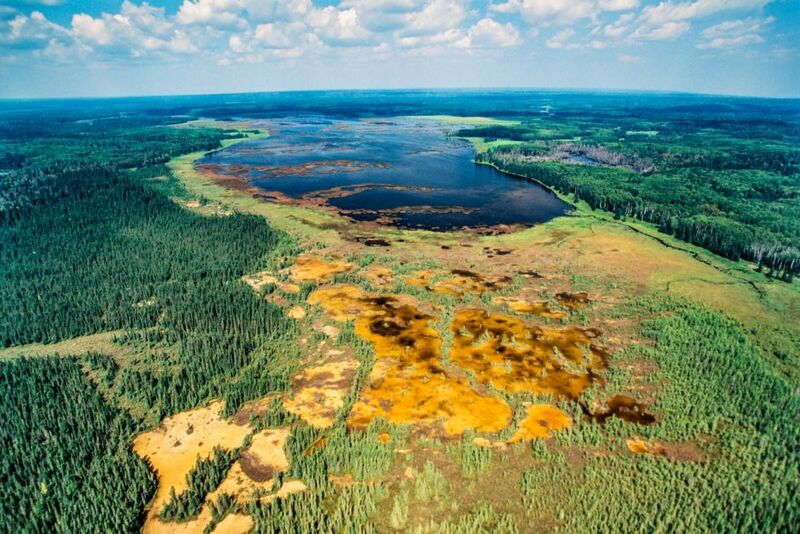 The North Seal River wilderness of northern Manitoba reads like something narrated by David Attenborough. It’s one of those modern frontiers that requires legit survival skills, but with Gangler’s Subarctic Adventures, everyday travelers can traverse these boreal forests and tundra looking for wildlife — like caribou, moose, and black bears — ride in vintage floatplanes, sleep under the aurora, and hike eskers (small sand dunes) and lakes. All 250 miles from the nearest road. Every adventure with Gangler’s includes private airfare, lodging — usually in a private, heated cabin — and home-cooked meals (and sometimes coffee delivery!). Treks last anywhere from three days to over a week, and you can customize your activities, too. The York Factory National Historic Site of Canada sits on the banks of the mighty Hayes River at the mouth of Hudson Bay. Time and harsh weather conditions have toppled gravestones and reclaimed most of the buildings that served as the Hudson’s Bay Company trading post, but the 1830s-era depot survives as the oldest wooden building on Canadian permafrost. It’s packed with artifacts, from kettles to cannon balls. The extremely remote site is only accessible by plane and boat from the town of Gillam, via Nelson River Adventures, and typically sees fewer than 80 visitors a year. Keep an eye out for polar bears migrating their way around the bay and beluga whales playing in the water. You said you were ready for an adventure, right? 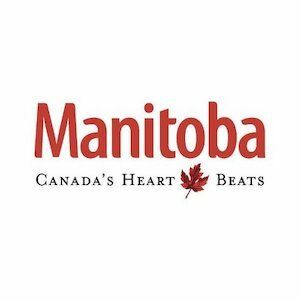 This post is proudly produced in partnership with Travel Manitoba. Why is there so much art in Winnipeg?